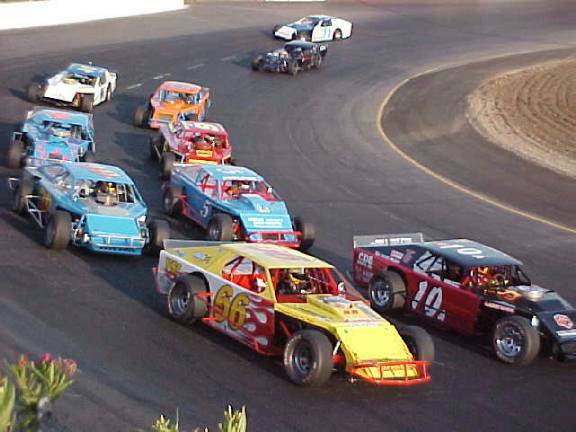 Four drivers claimed their first checkered flags of the 2003 season on GLIDDEN PAINT night last Saturday at Stockton 99 Speedway. 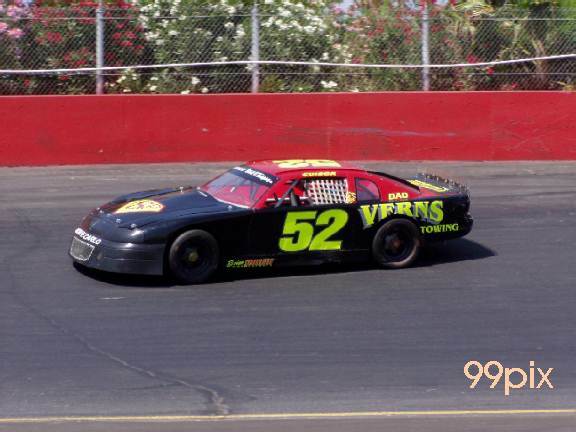 Only Grand American Modified driver Jay Linstroth of Citrus Heights had previously won during the NASCAR Dodge Weekly Series this season. 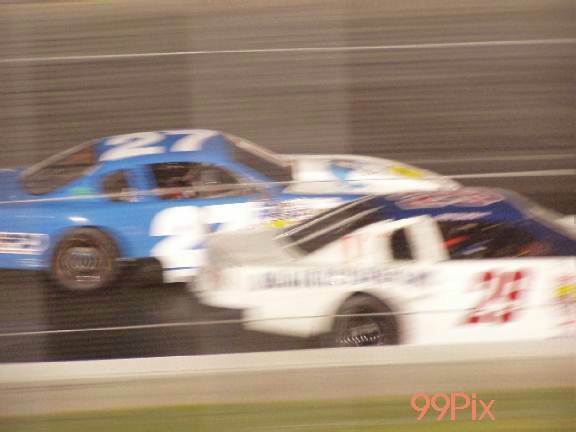 Valley Springs' Tracy Bolin, #29, led the final 12 laps, barely escaping with a photo finish over #27, rookie John Moore of Granite Bay in the Western Late Model division. 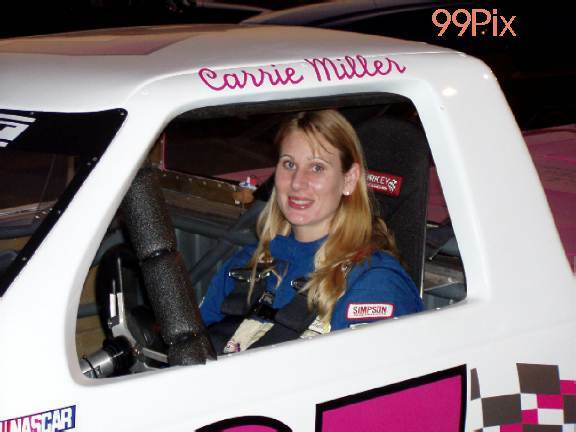 Bolin became the first WLM driver other than Modesto's Harry Belletto and Roseville's Eric Schmidt, who finished third, to win in the past three weeks. Manteca's Danny Guibor, #52, pole sitter, led 15 of the first 17 laps before he was involved in a three-car pileup on lap 21. Pacific Grove's Dave Byrd was fourth and Belletto finished fifth in the 15-car field. 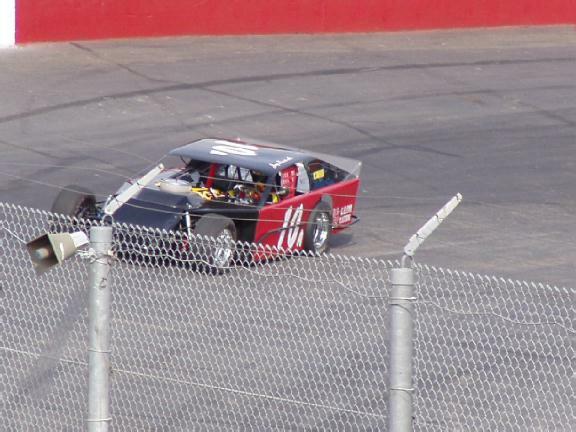 In the 30-lap GAM main event, #10a, Linstroth led wire-to-wire, coasting to his third win of the season. He remains the only multi-race winner in the division. Linstroth won for the first time since May 10. Ripon's Mike Regelman finished second, ahead of Modesto's Kyle Gottula. Ripon's Angelo Queirolo, who won last week, was fourth. Lodi's Michael Wendt gained the upper hand on the third-caution restart at the midway point of the Pure Stock main event. 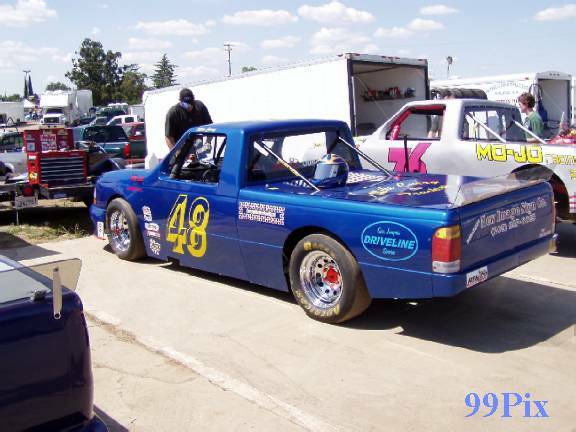 Wendt, who holds the track record in his division, led the final 15 laps for his first win of 2003. The 30-lap race had five lead changes. 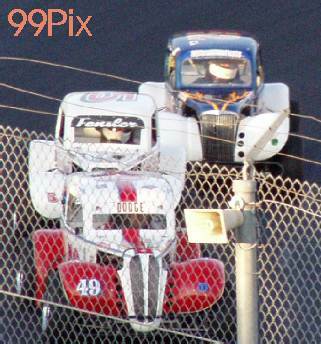 Stockton's Gary Shafer Jr., #96, had won four of the previous five races, but suffered an early exit. 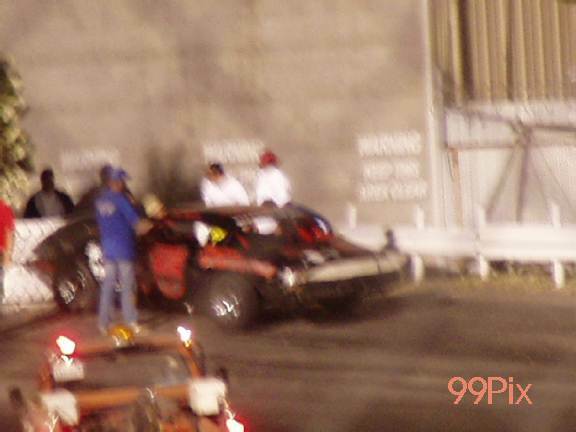 Shafer Jr. departed after a three-car wreck with Galt's John Medina and Stockton's Tom Dahl abruptly ended his night. Chad Holman of Stockton placed second and Jeff Ahl of Lodi finished third. Tracy's Brandon Trevethan, #4, became the fourth different Pro 4 Truck driver in as many races to grab the winner's circle this season. Trevethan took his first lead from Lodi's, #48, Mike Curry on lap 5 and never looked back in the 25- lap main event. Ron Robeck, #3, of Milpitas was second and Saratoga's Carrie Miller (left), finished third. Points leader Brett Barney of Rohnert Park did not race. 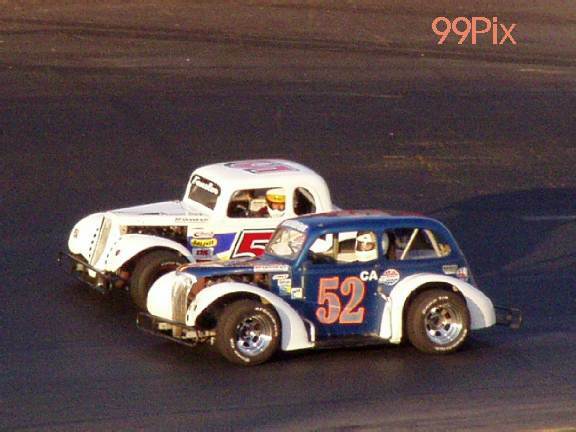 In a two-car battle, Cupertino's Ryan Mosher, #52, eventually overtook Elk Grove's Steve Fensler Jr., #5, in the Legends 30-lap main event. Mosher led 14 laps including the final nine, after exchanging leads with Fensler Jr. for most of the race. 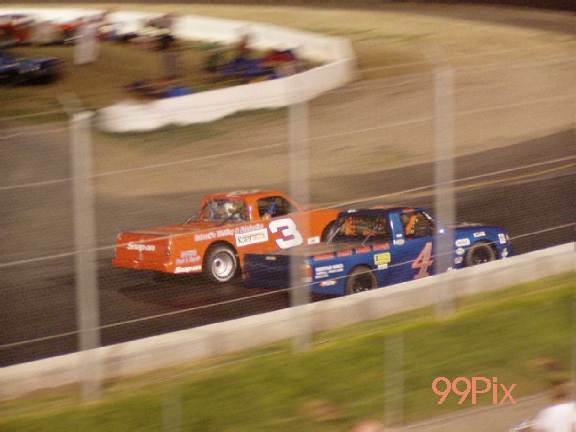 Fensler Jr. led one lap before Mosher gained the lead on lap 7. 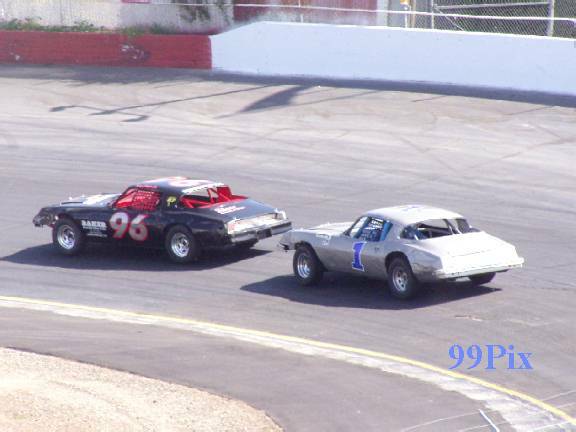 But Fensler Jr. regained the lead on lap 12, and stayed in front until lap 21 when Mosher forged ahead for good. Frankie Winchel of Sabastopol placed third and Pete Currin of Redwood City was fourth. Next Saturday, Stockton 99 Speedway will celebrate "U.S. ARMY NIGHT". Western Late Models, Grand American Modifieds, Pure Stocks and Pro 4 Trucks will headline an evening of celebration for America's armed forces.